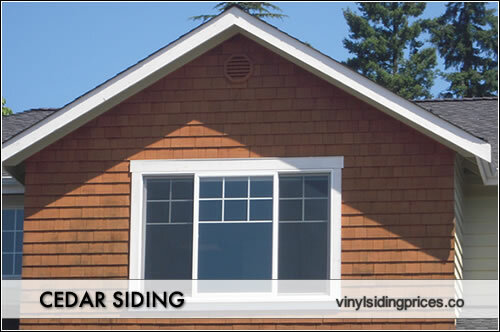 Cedar siding prices range from $3 to $6.50 psf installed. This includes all of the costs; the shingles themselves, all other project materials and installation and labor. Cedar shingles are a beautiful and natural material that make for great siding with the deep red hues and real wood grain textures. Low to mid range cedar shingles will cost $1 to $1.75 per square foot. This might be a white cedar, which is not as durable or long lasting as the traditional red cedar, although it does tend to take on a nice uniform silver color over time. Mid to premium cedar shakes and shingles will cost $1.75 to $2.50 per square foot. This might be the more traditional red cedar, which tends to be more durable and long lasting than the white. It is produced mainly in the Pacific Northwest and the one knock on the material is that it darkens over time and eventually can look blotchy and almost black. The other project materials will vary in price, but it is not unreasonable to put the price tag at the $1 to $2 per square foot. This will include items such as the housewrap, nails for the shingles, corner pieces, trim pieces, fascia and decorative accessories that often accompany siding projects. Cedar install pricing will run $1 to $2 per square foot. Installing shingles is relatively easy and can be done with a nail gun and little else. The cost for the installation is roughly eqiuvalent to vinyl siding. If the cedar shingles have to be stained or treated onsite, this will raise the cost to that $2 psf range. Low to mid range projects will price out at $3 to $5 psf installed. This includes the cost of the siding itself, all other project materials and installation and labor. Mid to premium cedar projects will price out at $3 to $5 psf installed. This includes all of the costs; the shingles themselves, all other project materials and installation and labor.